Sepax Glycomix SAX Columns Sepax Technologies, Inc.
With well-controlled surface chemistry and resin production, Glycomix resins exhibit high lot to lot reproducibility which leads to consistent column performance. The separation variation for Heparin from batch to batch is less than 1% for retention time and 5% for the peak area. Figure 2. High Lot-to-lot reproducibility of three lots of Glycomix™ SAX resins. Lot-to-Lot peak retention time relative standard deviation. Glycomix™ SAX has long column life time due to its resin surface chemistry and stable manufacturing process. Figure below exhibits one column's performance for duplicated injections. The column shows consistent separation efficiency. Figure 3. Chromatogram overlays of duplicated injections. 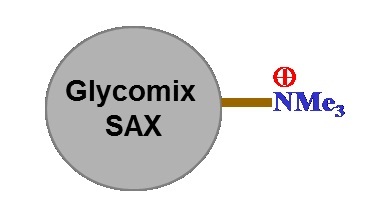 Glycomix™ SAX is able to separate components from commercially available standards. In Figure 4, Panel A shows the standard run with 20mg/mL Heparin, 1mg/mL DS and 1 mg/mL OSCS. 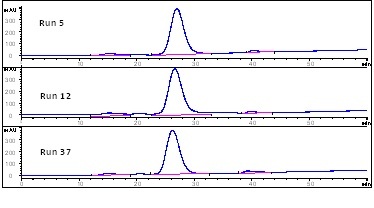 Panel B is the OSCS chromatogram with 1 mg/mL concentration. 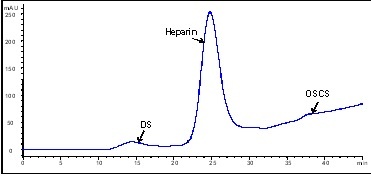 In comparison to Panel B, the small peak between DS and Heparin comes from the standard OSCS sample. Column running conditions are the same as for Figure 3. Glycomix™ SAX can be used in the quantitative analysis of Heparin and its impurities. Figure 5 shows the different heparin loadings over concentration range from 0.5 mg/ml to 10 mg/ml, 0.125 mg/ml to 4 mg/ml for OSCS and 0.25 mg/ml to 4 mg/ml for DS. 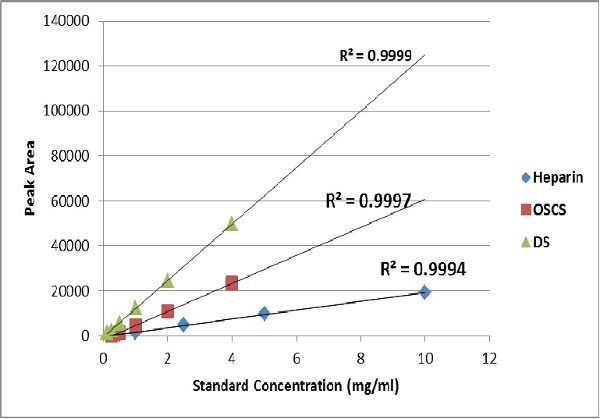 The R2 values for both standards exceed 0.99 in the tested concentration range. Figure 4. 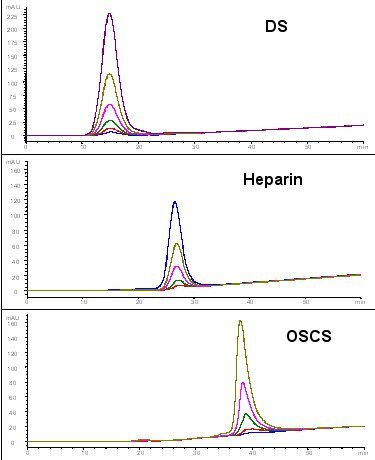 Chromatogram overlays of OSCS standard and Heparin with DS and OSCS. Figure 5. 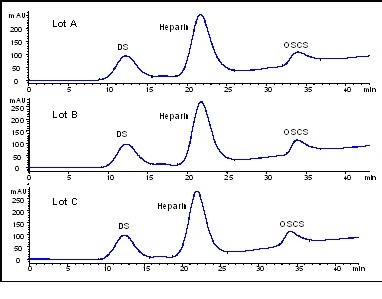 Chromatogram overlays of different heparin injections from 0.5mg/mL to 10mg/mL concentration, DS from 0.125 mg/mL to 4.0 mg/mL and OSCS from 0.25 mg/mL to 4.0 mg/mL. 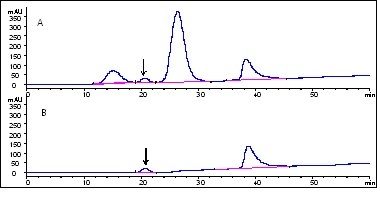 In comparison, Glycomix™ SAX performs superior to Dionex's column for heparin separation.1,2 Figure 7 shows the chromatogram of Heparin separation from Glycomix™ SAX. The resolutions are 3.8 between DS and heparin, 5.8 between heparin and OSCS. The U.S. Pharmacopeia (USP) requirements for the separation for DS/ heparin are 1.0 and 1.5 for OSCS /heparin3. GlycomixTM SAX has a much better separation resolution than USP's requirement. In Dionex's application note, Dionex IonPac AG11 guard with AS11 analytical column gives a 1.1 and 1.8 resolution for DS/heparin and heparin/OSCS respectively. Figure 7. Heparin Sodium, Chondriotin Sulfate B, and Oversulfated Chondroitin Sulfate separation on Glycomix™ SAX.